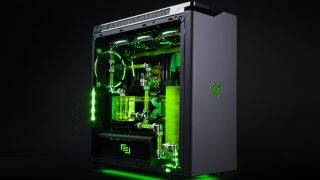 Maingear and Razer have got together to build a new gaming PC which combines top-notch components and a high level of customization to allow gamers to create the rig of their dreams (and possibly their bank manager's nightmares). The Maingear R1 Razer Edition PC features some nifty aesthetics and design touches, with that familiar Razer look combined with the likes of tidy 'origami wiring' inside and a liquid cooling system that looks, well, pretty darn cool. You can plump for Superstock crystal hardline tubing (as pictured below) or hardline tubing which is handcrafted from polished nickel plated metal. But looks wouldn't mean a thing if the PCs in this range didn't have the performance and components to back it up, and the pair of companies haven't stinted on this front, particularly when it comes to the top-end offerings. We are talking a choice of Core i7 (Skylake) or Intel Haswell-E (6- or 8-core) CPUs, up to 32GB of HyperX DDR4 system RAM, along with dual graphics cards – you can go for a pair of Pascal-based Titan X cards in SLI if you wish (you might want to wish for a ton of money, as well, because you'll need it for that option). As for storage, a selection of solid-state drives and hard drives are available, with SSDs up to 2TB (or 1.2TB if you plump for NVMe SSDs) and hard disks of up to 10TB in size. Min-Liang Tan, co-founder and CEO of Razer, commented: "The feature-set and craftsmanship of the R1 Razer Edition leave it in a class of its own today, and the customizable design leaves the door wide open for untold enhancements well into the future." The R1 starts at $999 (around £750, AU$1,320), although the Intel Haswell-E models start from $1,899 (around £1,425, AU$2,500), and the top-of-the-line machine with handcrafted hardline custom cooling goes from an eye-watering $4,099 (around £3,075, AU$5,400) upwards. If you spec the machine up with some of the beefier options we've mentioned, you'll have quite the wallet-busting price on your hands.